Bob Dillner is a man who just can’t keep away from racing. 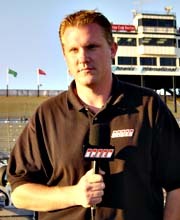 His day job is that of a NASCAR Nextel Cup Series reporter for SPEED Channel and he moonlights by serving as a commentator for ARCA events on SPEED as well. The rest of the time, he oversees the Speed51.com short track website that he founded five years ago. Even when Dillner goes on vacation, he’s got to be around a racetrack it seems. Clark has some tips already for Dillner as well. There is a great deal of mutual respect between the two competitors. "Johnny Clark is one hell of a racer,” said Dillner. “I love his style. He's patient-aggressive on the track and off the track he's personable, yet not afraid to get his fingers dirty. ...and in this corner, the #25 normally driven by Jay Hull. But beating Johnny Clark could be a tall order for Dillner. The SPEED Channel reporter has experience running competitively in Legends cars and the street stock-like CRASHCars at Lowe’s Motor Speedway, but running against one of the best short track drivers in the country will be a new experience for him. So when Dillner and his family spend some time in New England this month, he’s going to stop in at the legendary Oxford Plains Speedway in Maine for a little bit of racing action. 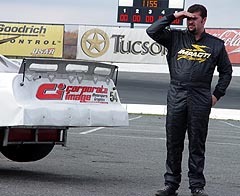 What will be different about this trip though is that Dillner himself will be driving in a 10-lap match race in the track’s Sport Truck division on July 20th. His opponent? None other than 2004 PASS Pro Stock (Super Late Model) Champion Johnny Clark. Dillner and Clark will be behind the wheels of the Speed51.com trucks normally driven by Mike Twist and Jay Hull. The match race at Oxford will take place as part of Oxford Plains Speedway’s Summer Racing Series on Wednesday night, July 20th. To find out more about Oxford Plains Speedway, Please click here. For more information on the match race and the #51 racetruck, be sure to check out Speed51.com or call Mike Twist at (207) 590-1786.